We’ll clean them & have them looking like new again! Gutters fill up with dirt and debris, this can often overflow during a downpour, or when gutters leak. This leaves the outside of the gutters, downpipes, fascias & soffits looking very dirty. Over time these can turn green and black as dirt and algae build up from rainwater, leaving your house looking very dirty and unattractive. During this service, we spray your gutters, downpipes, fascias & soffits with a special cleaning agent especially for lifting dirt and algae. We clean your gutters, fascias & soffits with our telescopic poles. Our long bristled brushes are specifically designed, and angled to penetrate behind your gutters, under your soffits, and remove all the dirt and grime that accumulate over time, leaving it gleaming and looking like new. Once we have completed our service we then carry out a final check so that we are happy, and it is at this point that we give you our satisfaction guarantee. 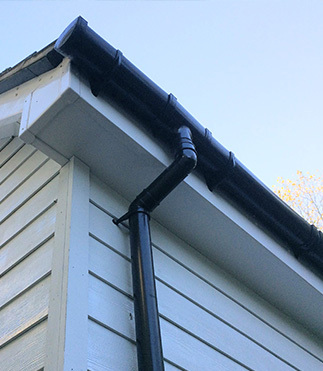 Why not add our gutter clearance service at the same time? 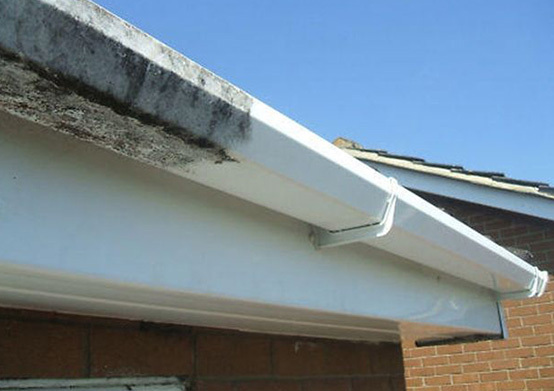 That way your gutters will be clear and working correctly, as well as being clean and gleaming! – Ask us for a quote! Recommendation – once a year – ask about our regular fascia cleaning schedule.